We all have different homes, tastes and ideas. This is reflected in the work we do: every project is one of a kind, every design unique. The furniture we create is exclusive, designed and made for you. At your request Jeremy will visit you in your home and take a detailed brief to understand exactly what you desire. 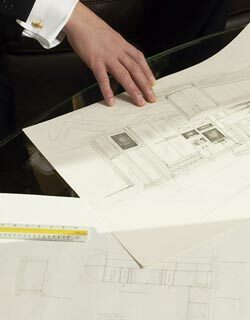 He will integrate your ideas into the design concept. On his return visit Jeremy will present your bespoke furniture design. This will incorporate hand-drawn elevations, a 3D visual, a layout plan for fitted furniture plus costings for the project. Following further discussions the design will be fine-tuned as necessary. At this stage we recommend a visit to a previous commission to sample the quality of our furniture in situ. Payment of a deposit will then secure your order in our production schedule. Samples of panels, moulding details, handles, veneers and finishes will be provided for your approval before commencement of production. Once the project is under way we liaise regularly with you and other trades and carry out site visits to ensure schedules are met for the installation of furniture by our team of experts.